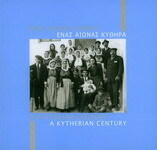 The following books and CD's can be purchased from the Kytherian Association of Australia. Purchase of three books, in one order attracts only AU$10.00 postage. Travel & information guide, in English Price: AU$25.00ea.